ClassicCars.com is the world's largest online marketplace devoted to classic and collector vehicles. Each month, millions of shoppers search our catalog of nearly 30,000 classic cars and trucks, muscle cars, hot rods, street rods, and specialty vehicles. Our eBay listings feature inventory from our network of more than 500 dealers across North America. For more information on this listing, please contact the dealer directly. 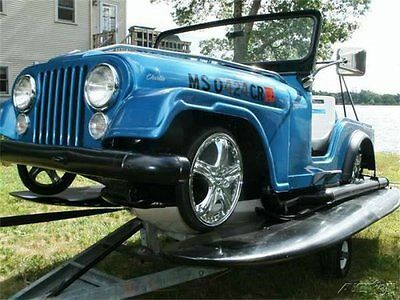 Check out this absolutely wild Custom 1972 CJ5 Jeep(jet)ski! 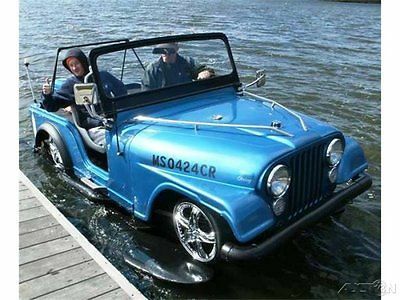 Built in 2014 this one-of-a-kind started with 1972 All Fiberglass Jeep CJ5 Tub built up on a Fiberglass hull. It has a 50hp Johnson outboard on a custom bracket with power trim & tilt. It has all nautical lights for running at night plus all the vehicle lights work including head lights, tail light and blinkers. 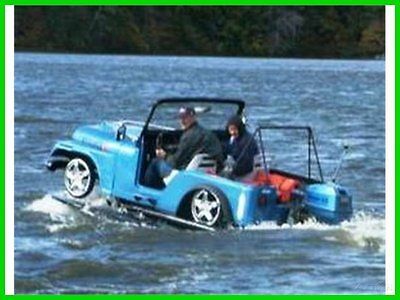 This thing is an absolute blast to use so grab a friend turn up the stereo and you will be turning heads everywhere you take her and you can take her anywhere because its great in any water due to the two 12 ft wind surfing boards that act as outriggers so its real stable and not tippy at all plus it has a full windshield. This thing is custom everything from the beautiful paint job to the detailed shifter console and dash board. 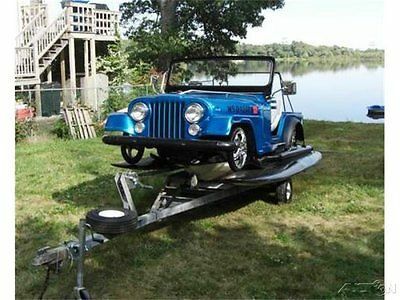 This beauty also comes with custom fitted boat trailer. ClassicCars.com is pleased to present this eBay listing on behalf of the dealership named in the listing above. The vehicle represented in this listing is for sale by the dealership and not by ClassicCars.com. We understand that buying a vehicle sight unseen can be difficult. If you are interested in purchasing or making an offer, please call the dealership for complete detailed information. Classic cars by nature are imperfect and as with any cars are subject to cosmetic wear and tear and potential mechanical failure, therefore it is ClassicCars.com policy to recommend an independent, professional inspection before purchasing a vehicle, especially if it is being bought sight unseen.Per the eBay User Agreement, when you hit the Buy It Now button you are entering into a legally binding contract and are committed to purchasing the vehicle as described above. We encourage you to contact the dealership with questions and for more information before committing to purchasing the vehicle.This vehicle is for sale on other websites and at other locations, if the vehicle is sold every effort will be made to remove the listing from eBay as quickly as possible. The dealer reserves the right to end the listing if the item is no longer for sale.All vehicles are sold "As Is", there are no warranties provided.The final price does not include shipping, tax, title, registration fees, or other dealership fees. It is the buyer's responsibility to provide for any state or local taxes. For more details on fees please contact the dealership directly.The buyer is responsible for the shipping of this vehicle unless stated otherwise by the dealership.All payments must be clear before the vehicle can be released to the new owner.